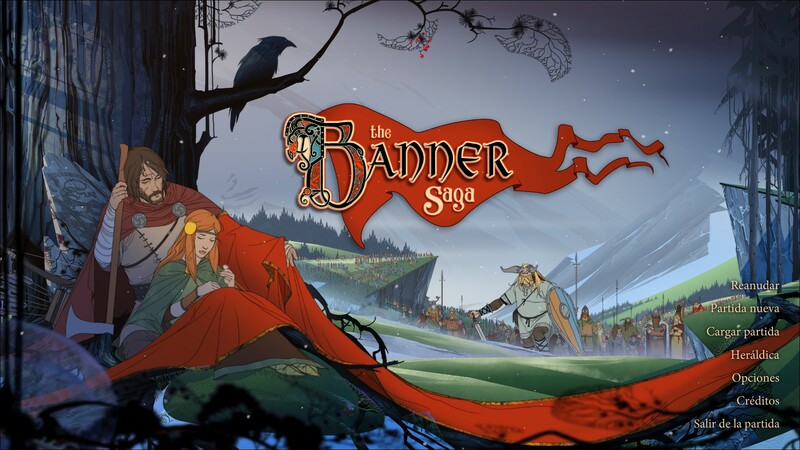 The Banner Saga is the debut release from Stoic Studio, a trio of indie devs that left BioWare. It’s impossible to talk about the game without speaking about its absolutely tremendous artwork. Reviewers likened it to golden age Disney, but to me it more recalls the art style of Don Bluth. It’s a pleasure to behold, and I found myself lingering during play just to take in backgrounds or character art. It also retains the animation style for combat, which is a great. For some reason I was afraid the stellar artwork would be for conversations only, and that combat would be some ugly polygonal affair, and was happy that wasn’t the case. It’s a triumph of art direction and vision, and immediately draws the player into the world in a way a more familiar art framework would not. Small screenshots really can’t do it justice, but I mean, just look at this: That being said, there were occasional almost hilarious lapses in art judgement. For instance, below is Bellower, a giant implacable foe who pursues you for a large part of the game, and in the narrative, is absolutely terrifying. But in battle, he’s a palette-swapped version of a common enemy, and he does ridiculous little shimmy-dance. Look upon him and despair! It’s also worth calling out the superb world building in The Banner Saga. It’s basically “Viking World!”, but rendered with real grace. While clearly inspired by and drawing from Norse mythology, it feels fresh and distinct, not a rehash. The world is also introduced expertly throughout the narrative by carefully introducing questions (like “What’s the deal with the Varl?”) and later resolving them. The world map is also beautiful, and filled with little informational tidbits that I really enjoyed exploring. The world-building and narrative really work in lockstep, and the pivotal plot points also serve to draw you into the world. It’s also super depressing, but in a wonderful way. It’s a bleak world- the gods are dead, an unstoppable enemy is assailing civilization, and now the sun itself has stopped in the sky. It’s like, Dying Earth but with Vikings. Many of the world’s inhabitants have such a grim nihilism, which makes the beautiful art all the more inspired- a lesser vision would’ve dressed the world in drab grays and dark colors. While I was playing through it, I actually had dreams about the world ending, which is the mark of any great game. The Banner Saga is absolute delight for its art, narrative and world-building, and is worth the price of admission for those aspects alone. Unfortunately, I feel like it’d make a better movie (or series!) than a game, because it’s… actually not that great a game. Or more accurately, games, since it’s really three games in one, which is two more games than it needs to be. First and most obviously it’s a tactical squad-based RPG. You have a team a dudes, and fight enemies. It’s adequate at this. I thought there were some interesting mechanics here: Health and damage are a shared resource (so you do less damage the more hurt you are), you have armor that absorbs damage to your health, and characters have different values for damaging armor directly or damaging health. I didn’t love that system, but I can live with it. But there’s too little experimentation in the troops, the special abilities vary drastically in power, and too little variation amongst the enemies, who all felt really bland. I love tRPGs like Tactics Ogre, but this felt like a very light version thereof. I also absolutely hated that experience was tied to kills, which I always think is a terrible mechanic. “Hold up everyone! We’ve battered the enemy into submission, but let the new guy kill him so he gets more powerful!” Like, c’mon. That is the worst. In addition to the tactical RPG, it’s also a sort of Oregon Trail game, where you travel and manage resources. While I really like the premise here, and it works well with the plot which has the characters moving/fleeing all over the place, it always felt a little slipshod. “Food” is the main resource you have to manage, but I found I always had enough, or absolutely none and no way to get more. You have very little ability to control the resources really, so it’s more like a RNG generator picks your morale/causalities for you. You also have a sort of wagon-train of civilians, human fighters and varl that consume your food, but the relationship between them isn’t show in game. Like, presumably each of those populations eat X food units a day, but the game just does all the math for you and shows you how much food you consume a day. I understand wanting to limit inane numbers-driven gameplay, but I think it was a mistake to simplify it so much, because then the cost of bringing on additional people is hard to quantify. I loved some of the dilemmas and such that came up during the game (a la Oregon Trail’s classic river fording), and there’s a phenomenal sequence towards the end where you have more tasks to complete than you have time for, so you start having to make compromises with resources (and lives). But too often, the consequences of such dilemmas felt arbitrary or meaningless. In essence, this aspect of the game could’ve worked as the sole mechanical focus if it had been executed well, but instead just feels uninspired. Lastly, the game is a sort of choose-your-own-adventure conversation game, with branching conversation trees. This is the main way the narrative is advanced, and at times felt immersive and character driven. But the consequences of decisions were again too opaque or too meaningless. I get that what the game is going for is “You did what you thought was right, but then this happened instead!”, and its trying to convey a world where sometimes you try your best but it doesn’t matter in the end. There are moments where it succeeds at that. But more commonly, it was closer to “Pick whatever, because something good or bad could happen regardless of what you choose!”. Again, I think this is another aspect where the entire game could just be this, like a Telltale adventure game. But instead, it’s under-utilized and inconsistently applied. All three of these game-systems are adequate on their own. Not great, but perfectly fine. However, the way these systems interact is terrible. “Prestige” is the catchall currency of the game, and is used to level up heroes, buy equipment for the heroes, and also buy food. In theory this means having to make meaningful tradeoffs, but in practice it was annoying and strange. “Hmm, do we buy food, or become more powerful fighters?” doesn’t really make much sense as a player choice. One is purely mechanical, and the other is ludo-narrative, so they don’t feel like natural trade-offs (like, buying food or hiring guards, say). I also hated how the conversation engine interacted with the tRPG fighting: You mainly get ‘Prestige’ from fighting battles with the heroes, so whenever the narrative was like “So, do we do the smart thing people would actually do and avoid the fight, or go in and kill stuff for no reason! ?”, I always chose to fight just to grind for money to buy food. Which makes no sense! Lastly, while the plot is lovely, it wreaks havoc on the game itself, and your heroes join or leave your party with basically no warning. Heroes who, again, you’ve invested your universal currency of Prestige in to level up and buy equipment for. Maybe the intent was to create a feeling of loss, like, “Yeah, people die or leave and you have to deal with it.” But because of the regularity that it happens with, it doesn’t feel earned. I guess you could memorize the comings and goings for a subsequent playthrough, but I don’t think the game really warrants playing more than once. All it encouraged me to do was spread the levels/equipment around as evenly as possible to minimize the potential impact when the plot snatched someone away. It’s amusing to note how when indie developers break away from the oppressive AAA companies they work for, the problems of that studio often stay with them. So in the same way the stain of Ken Levine’s first person perspective “story” gameplay lingers on Gone Home, the great worldbuilding and tacked on gameplay of BioWare seems to have stayed with Stoic. I think there’s a lot to learn from in The Banner Saga though. Its game elements I think are largely failures, but how they fail is instructive. They feel too arbitrary, remove player agency too much, and they’re connectedness creates more problems than synergy. They’re not capricious or bad, just rough and not well thought out. The narrative and world are inspiring for their originality, and the art is again the unquestionable centerpiece of the experience. It’s tempting to draw a comparison here between other games with stellar graphics that are otherwise bad games, but that’d be unfair. Investing all your resources in photo-realistic graphics isn’t inspired, it’s a safe and boring bet. 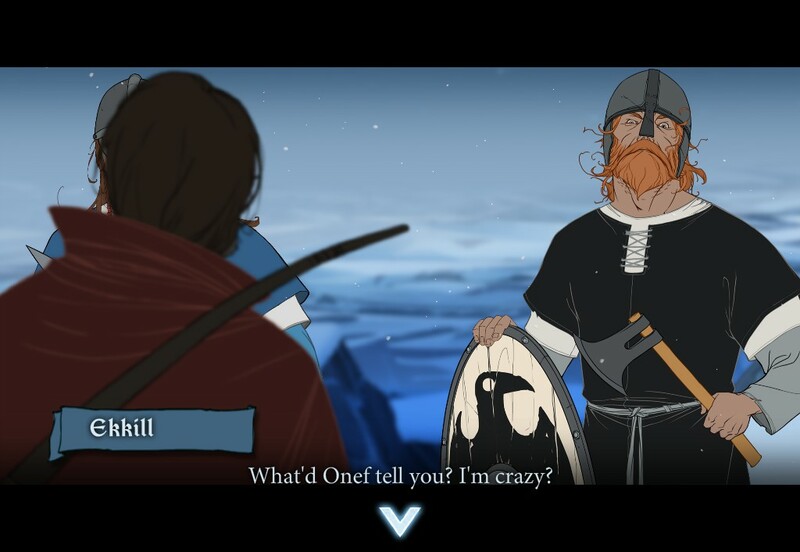 The Banner Saga rather feels like a really unique vision that leveraged its amazing art into the experience itself- it is not a bad game with great art slathered on top. Rather, its just that its narrative aspects are just so good, it highlights rather clearly how imperfect its game systems are. But it is absolutely worth examining.